Like other ancient civilisations, slavery was an integral part of society in ancient Rome. Slaves in Rome consisted of a sizeable portion of the population and were involved in a variety of work. Slaves from lower social backgrounds who could not read and write were involved mainly in manual labour, however, slaves from respectable families or educated backgrounds often got opportunities to work in respectable professions such as arts and teaching. This was particularly true for the Greek slaves who were often more educated than other slaves. According to the 1st century BC Greek historian Dionysius of Halicarnassus, the institution of Roman slavery began with the founding of Rome itself when the legendary founder Romulus allowed the fathers of Rome to sell their children into slavery. Slavery was an established institution in Rome during its time as Republic and Empire. The oldest legal code of Rome, The Twelve Tables, also makes a reference to slavery indicating it as a long standing institution. Roman slaves working diligently for their masters. The main source of slaves in ancient Rome was the wars that were almost a common feature of the ancient world. Rome continued to be at wars with other empires and neighbouring states because of its constant expansion. For example, the Punic Wars with Carthage, Roman Servile Wars, and wars with the Greek states brought in a huge inflow of slaves. Similarly, the breakdown of the other empires also contributed to this slave economy. Thus, for instance, the Greek geographer Strabo tells that an enormous slave trade emerged from the collapse of the Seleucid Empire. 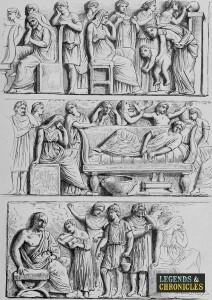 The details of the daily lives of slaves in ancient Rome varied according to the nature of work they did. Slaves who worked in more respectable professions such as teaching, music, accounting and medicine. had relatively easier daily lives since they did not have to do hard manual jobs. Besides, they were also provided with respectable clothing suitable for their professions. However, slaves who were manual workers could have very tough daily routines and had to work regardless of weather conditions and with little wages. Just like the everyday lives of slaves in ancient Rome, their clothing also varied according to the jobs they did. A lot of slaves did menial jobs such as working on farms, cleaning, working in sewers and public baths. These slaves usually wore just a loincloth which was practicable for their work. Slaves who worked on agricultural lands were given a tunic every year by their masters and a pair of wooden shoes every two years. Slaves in ancient Rome who did more respectable jobs had better clothing since the clothing of such slaves was included in the status symbol of their masters. Slaves in ancient Rome were an integral part of the society and their number increased as the empire expanded. At the height of the Roman Empire, it is estimated that nearly 40% of the population of Italy consisted of slaves. It is also estimated that there were between 10 and 18 million slaves in the whole Roman Empire. The role of slaves in society became very important for the running of the economy with the passage of time. Slaves were involved in all sorts of petty as well as respectable jobs and the Roman economy was in essence an economy that was run by the slaves. Slaves in ancient Rome rarely, if ever, had separate quarters to live. Slaves who worked on agricultural lands or construction works were often given barracks where they shared place with other slaves. Thus the owner of Chedworth Villa who owned over 400 slaves provided them with barracks as their residence. This largely depended on the whims of the master. If the master was wealthy and happy with the slave, he could give him respectable residence. If not, the slave could live in pretty harsh conditions. Roman slaves could and did do all sorts of jobs. The most common form of slaves indulged in manual works such as construction, farming, and cleaning. Slaves who were educated and hailed from respectable backgrounds were employed in more respectable professions such as teaching, music, art, copying of texts. Greek slaves had particularly high status among slaves and were usually employed in better professions because they were well educated and cultured. 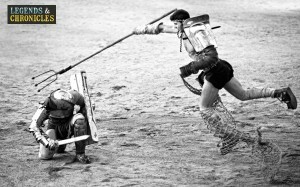 In Roman times, slaves would often be used in gladiator combat. The names of various famous slaves in Rome are well known, the most popular of all was Spartacus who escaped with other slaves during the Third Servile War. This was a major slave uprising with slaves fighting against their master for a long time but ending up in defeat. Spartacus was a former gladiator and an expert military leader. Other famous names include Onesimus who ran away from slavery but came back to Rome after being persuaded to return by Saint Paul, Volumina Cytheris, and others. Slaves in ancient Rome did not have any legal rights and were dependant on their masters. Their masters could treat them according to their will and thus the slaves were entirely at the mercy of their masters. By law, slaves could not own property and could not marry. However, they could enter into an informal kind of marriage which was known as ‘cohabitation’, although the children of this union were considered illegitimate. Roman slaves however were considered free citizens if their masters freed them, and in this case they were also given the right to vote. As time went on the legal rights of the slave continued to grow with the expansion of the vast Roman empire. Slaves in ancient Rome were an essential part of the culture, just like most other ancient societies. They did not have any legal rights during the initial years of the empire but as the empire grew, various emperors accorded increased rights on the slaves. Slavery was widespread in the Roman Empire and at the height of the empire there were tens of millions of slaves in Rome.